Of course, I can’t forget a fabulous wedding morning (together with your bridesmaids) full of manicures and pedicures, drinking champagne and OJ, along with a glamorous hair and makeup session. Today I want to focus on the last point in the list above: the bridal veil. Specifically, how to choose a complimentary veil length for your beautiful gown — the one you spent countless hours scouring bridal stores! There are many different options when it comes to buying your veil: from length to material, and trims to embellishment; It can be overwhelming to know where to start. The decision to buy one veil over another really comes down to how much you want to jazz up or soften the look of your wedding dress. 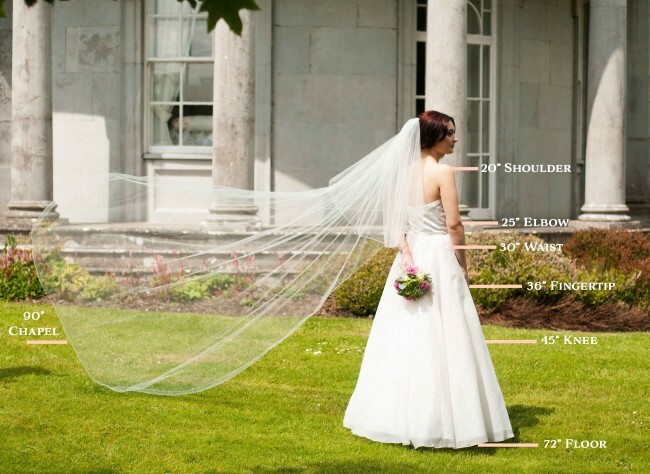 With that in mind, I have put together a complete guide to wedding veil lengths to help you choose the perfect one for your big day. 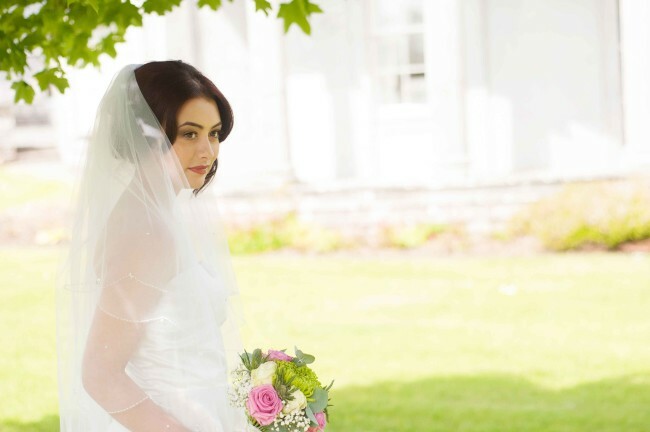 Birdcage veils are the perfect length for an outdoor wedding: short! The last thing you want to do is tame a long veil that has been picked up by a gust of wind, while you say “I-do”. Traditionally birdcage veils are short and extend just past the chin. However, some brides wear them to the side to allow the netting to sweep across their face for a more dramatic and bold angled look. 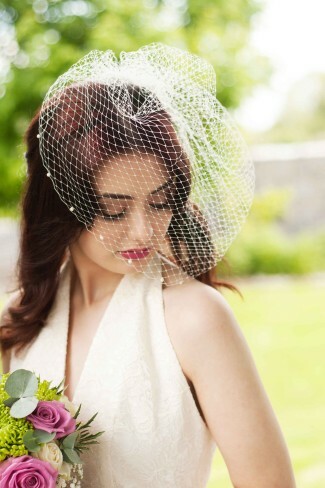 A birdcage veil is great if you want a vintage vibe, but also work well to add a bit of drama. Fashion forward, vibrant, and confident brides-to-be love a birdcage veil on their big day. A visor veil is a short veil that does not extend past the bride’s chin. They have a similar feel to a fascinator, which one would find women wearing at a British horse racing event. Each side of a visor veil can be pinned behind the ears. Visor veils usually have some sort of embellishment on one side, like a fabric flower or rhinestone comb, for an added touch of elegance. Shoulder length veils traditionally measures around 20 inches in length and are perfect for gowns that have a lot of detailing, such as beading on the lower back, waist, or bust. This veil length rests on your shoulders or slightly covers your shoulders. 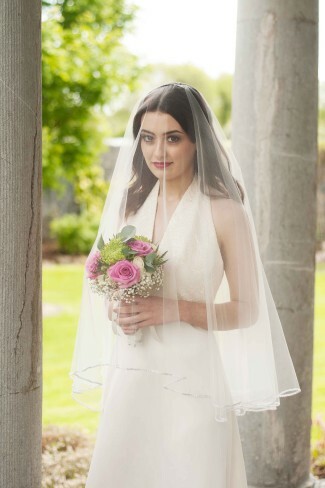 With the veil being shorter it will not draw attention away from the details of your gown and will allow for a clear view when taking photographs. A great option for less formal events where the bride wants to wear a veil but mainly show off her gown. It is important to note that the placement of a shoulder length veil can make a drastic difference to the overall length of the veil. Be aware of your veil placement when ordering a shoulder length veil. The elbow length veil is considered the universal length and measures 25 inches. As you guessed it, this veil length extends to your elbow. Neither too long nor too short, it pairs nicely with most dress styles. It can be a single tier veil or have multiple layers with a blusher. Although more appropriate for an informal setting, the elbow length veil is stunning for a ball gown because the veil ends where the fullness of the skirt begins. Note: Waist length veils are slightly longer than an elbow veil and measure approximately 30″. Both suit gowns that do not have a train. The fingertip length veil is also universally flattering and is a commonly worn style of veil. Fingertip length veils look beautiful on any body type and coordinates perfectly with most gown styles. It is called ‘fingertip length’ because the length is approximately 36 inches, extending to the bride’s fingertips. A great choice because it allows a bride to wear a longer veil that won’t block the focus of her beautiful gown, as you can still see it through the sheer fabric. The knee length veil is a beautiful option for a bride wearing a fitted gown without a train. It measures approximately 45″ in length and should fall between the knee and mid-calf. 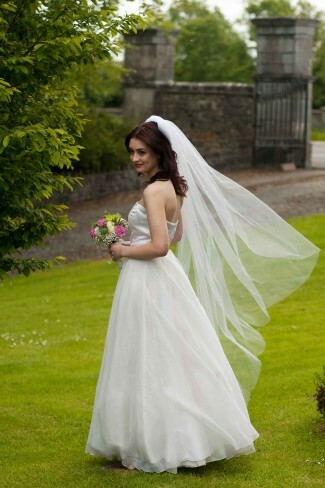 If you fancy a long veil to wear throughout your reception, then you should select a knee length veil. It gives you the freedom to move around during the evening without having to drag the veil around. 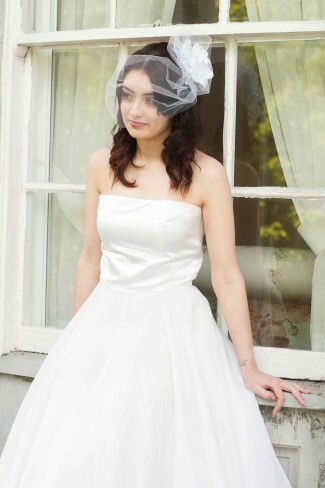 Beautiful waist and bodice detailing on your gown will benefit from a knee length veil. Note: The ballet or waltz length is usually between 54″ to 60″ long and should fall between the calf and ankle. Floor length veils (sometimes referred to as ballet length veils) should be long enough at 72 inches that they just brush the floor and almost match the length of the bride’s dress. The perfect match for a full length gown that doesn’t have a train. The beautiful flowing fabric brings an elegant feel and adds a little extra volume to your bridal look. Pairs beautifully with either a sheath silhouette or ball gown. Are you looking for a regal entrance a la princess Diana? You will want to choose a cathedral length veil, the longest veil lengths that ranges between 120 to 144 inches. Cathedral veils are considered formal and should be worn with a semi-cathedral or cathedral length gown. This veil type should extend past the bride’s train, and when spread out still allow the gown to be seen. Think for a moment about a wedding scene in a romantic movie. Remember a moment when the dad or groom in the movie lifts the tier that covers the bride’s face – this is called the blusher. It is a short, single layer worn over the bride’s face before the ceremony that you can opt to add to an existing veil or wear alone. It usually measures 30 inches in length and is a good addition if you are looking for a little height and volume. Check out this blog post I wrote over on Classic Veils to find out who should unveil the bride. A drop veil consists of one beautiful layer of tulle cut out in a circular shape, which looks like it has been dropped over the wearer’s head. Traditionally a drop veil did not have a comb, allowing the bride to adjust the veil to the desired front and back length. Made famous by Grace Kelly and later Kate Middleton, the drop veil is perfect for a bride looking for less of a poofy look and more of a classic style. The drop veil is a great option if you are undecided on hair style as it can be worn in up or down hairstyles, flowers in the hair, tiaras, or jewels. A mantilla is a type of veil that is made of either silk, tulle, or lace and has a lace edge around the whole veil. The veil has a comb under the lace at the very top, which allows the lace to drape smoothly over the bride’s head and shoulders to frame her face. Fingertip length is a good length for a Mantilla veil. Typically veils come in three different widths to create different degrees of fullness at the top and sides. 54 inches: A 54 inch wide veil will fall behind your shoulders and be sheer enough to show off your gown. This width is a great option for gowns with decorative sleeves or straps. 72 inches: A veil in 72 inch width will offer moderate height with a more romantic feel than a 54″ width. If you are thinking of wearing a spaghetti strap dress, this width is a good option because it offers coverage around the arms. 108 inches: A veil that has a 108″ width provides fullness on top. A great option if you are thinking of wearing a strapless gown, and would like to have coverage around your shoulders and arms. A sophisticated wedding gown should shy away from a 108″ width. The bridal veil you choose should not overpower your gown. Wearing a simpler gown provides more freedom to choose an ornate veil with embroidery, pearls, or crystals. Consider your hair style options before you decide on your veil length. 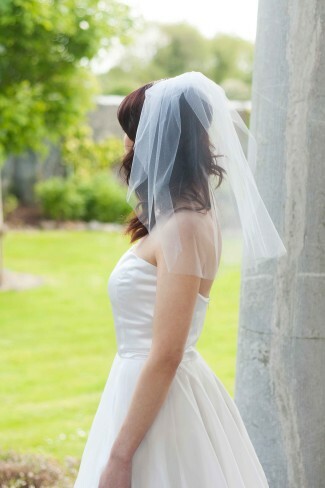 If you want to wear your hair down in big romantic curls, pin the veil to the top of your head for best results. An up-do hair style can wear a veil with a tiara or rhinestone flower comb. Stay away from a shoulder length veil. Always remember to bring your veil or hair accessories to your hair trial so that your stylist will know exactly what to expect for your wedding day. Check out my Custom Bridal Veil option to create your own unique veil online.